Ian McKellen & Derek Jacobi. And speaking of gentlemen gays! Have you seen Vicious? It's a hilarious series from 2013 which has been aired in two seasons. And there wil be some kind of special episode this year as well. I love it! 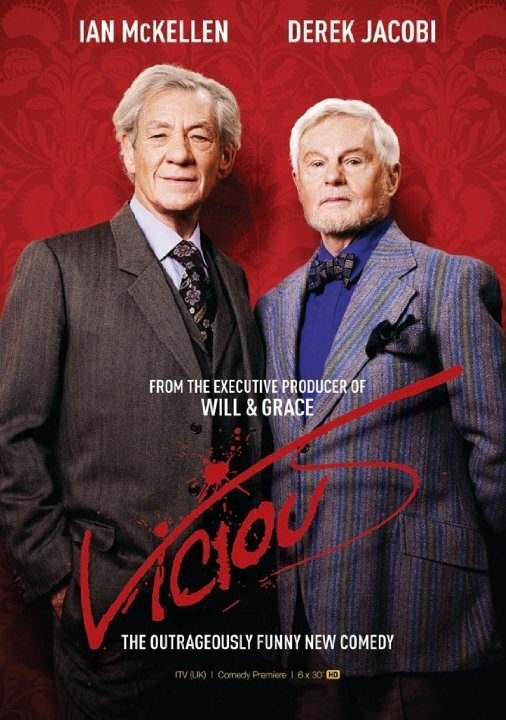 It's about Freddie Thornhill, played by Ian McKellen and Stuart Bixby, played by Derek Jacobi. They have been a couple for about 50 years and sometimes it's not clear if they love eachother or hate eachother because they are nagging and insulting eachother all the time. And it's hilarious! Ian and Derek are such great actors and I really like that kind of sofisticated British humour! And also, the character Ash (Iwan Rheon) is so cute! And a fun fact is that Ian McKellen had a crush on Derek Jacobi in Cambridge! How precious! I adore this show!! i love the juxtaposition between their relationship when it first started and how it is now! their banter and quick comebacks are so funny! and it doesn't hurt that Iwan Rheon is a cutie pie! He really is! I love his dialect! And I love his interaction with Violet! Oh i love his interactions with violet too! so goood! I hope the show returns for a third series!